You are currently browsing articles tagged New Brunswick. Joseph Huntington Jones, D. D., the brother of Judge Joel Jones, was born in Coventry, Connecticut, on August 24th, 1797. He graduated at Harvard University, in 1817. For a time he was employed as Tutor in Bowdoin College, Maine. He completed his theological studies at the Princeton Theological Semi­nary; was licensed as a probationer, September 19th, 1822, by the Presbytery of Susquehanna, and was, by the same Presbytery, ordained as an evangelist, April 29th, 1824. On June 1st, 1824, he began his labors in the Presbyterian Church at Woodbury, New Jersey, and was soon installed as pastor of that church. Here he labored with very great success. At the same time he also supplied the feeble church at nearby Blackwoodtown, which shared the blessing enjoyed by that of Woodbury. In 1825 he was installed as pastor of the Presbyterian Church at New Brunswick, New Jersey. Here he remained for thirteen years, proving himself to be “a workman that needeth not to be ashamed.” His ministry was honored of God by at least three seasons of religious awakening. In 1838 he became the pastor of the Sixth Presbyterian Church, in Phila­delphia, and continued so for twenty-three years, his efforts being crowned with a manifest blessing. From 1861 to 1868 he was Secretary of the Relief Fund for Disabled Ministers, in which capacity he did a noble work, for which he deserves the lasting gratitude of the Church. He died on December 22d of 1868. Dr. Jones was an exemplary Christian, an in­structive preacher, a faithful pastor, an interesting writer, and a gentleman of great urbanity of manner and suavity of disposition. The Influence of Physical Causes on Religious Experience (1846). The Life of Ashbel Green, V.D.M. (1849). Man, Moral and Physical; or, The Influence of Health and Disease on Religious Experience. 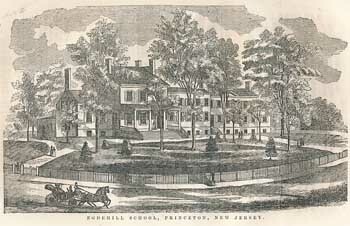 (1860). Editor and “Commemorative Discourse” [p. 69-86] in Autobiography of William Neill : with a selection from his sermons (1861). The Brazen Serpent; or, Faith in Christ Illustrated (1864). Elisha Pope Swift was born in Williamstown, Massachusetts on August 12, 1792. His parents were the Rev. Seth and Lucy Elliot Swift. His father was pastor of the Congregational Church of Williamstown. Through his mother he was descended from Rev. John Elliot, the Apostle to the Indians. Elisha received his collegiate education at Williams College, in Massachusetts, and his theological education at Princeton Seminary. He was licensed to preach by the Presbytery of New Brunswick, on April 24, 1816 and was ordained by a Congregational council in Boston on September 3, 1817, with a view to setting out for foreign missionary work. However, the American Board of Foreign Missions was compelled to delay his departure and so employed him for a time as an agent in the raising of funds. In 1818, Rev. 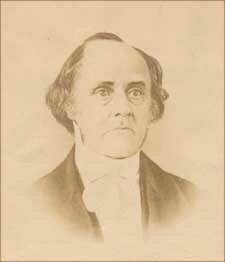 Swift served as pulpit supply for several Presbyterian churches in Dover and Milford, Delaware, and then in 1819 he answered a call to serve as the pastor of the Second Presbyterian Church in Pittsburgh. Here he continued to serve for thirteen years. From 1831 to 1835, he served as Secretary of the Western Foreign Missionary Society, which was at that time located in Pittsburgh, and it was only in 1833 that he resigned his charge as pastor of the Second Presbyterian Church, in order to more fully devote himself to the work of missions. Rev. Swift had been the leading force in organizing this Society, and it was greatly shaped by his character and ministerial gifts. By its location, the Society was fathered along by the Synod of Pittsburgh, and after several changes, both in title and in location, the Society eventually became the Board of Foreign Missions of the Presbyterian Church in the U.S.A. In the summer of 1835, Dr. 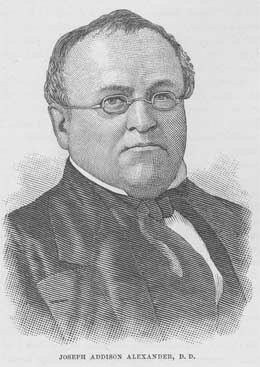 Swift resigned his position as Secretary of the Missionary Society and became the pastor of the First Presbyterian Church in Allegheny, Pennsylvania. He then served this church for twenty-nine and a half years. In the last five years of his life, with his strength beginning to fail, the congregation called Dr. Swift’s son, Elliott E. Swift, to serve alongside his father. This arrangement allowed Dr. Swift to preach as he was able, up until about six months before his death. At last, on April 3, 1865, the Rev. Elisha P. Swift passed from his earthly labors and entered his eternal rest. “Man is, in himself, a lost, ruined and perishing sinner. Of this fact, the world is full of the most convincing evidence. The Bible professes to reveal to us God’s true and only system of salvation. This is a dispensation of life to guilty man through a Mediator, and it is also a distinct practical principle of the heart and life, developing itself by the production of a free self-consecration of its recipients to the glory of God and the well-being of mankind. Its vital power–its ascendancy over the inner man, in the production of pure and holy principles and actions, is an essential evidence of one’s interest in its blessings, while the most abundant and convincing manifestations of it to others becomes the surest way by which its great Author is honored and the world improved. Hence the lives of devoted Christians become useful and instructive, just in proportion as they are truly and wisely conformed to the great pattern, and the examples and biographies of eminent believers stimulate the pious in the path of duty, and impress the consciences of the wicked with a sense of their criminality. “Periods of great trial and persecution in the world; and seasons in which God has, by His providence, especially called forth the visible power of religion, or remarkably poured out His Spirit upon the earth, for its increase, have been most distinguished for the development of the Christian principle. The present state of the world is peculiarly favorable to its useful display in judicious and disinterested efforts to bring millions of benighted and perishing sinners into the kingdom of God. The temporal and eternal benefits which the gospel can impart to the heathen are beyond all computation; and the Bible, while it urges the duty of its immediate dissemination, pledges its own veracity for the certainty that it shall eventually overspread the world. The events of providence are now more and more distinctly every year indicating the near approach of that joyful consummation. “The labor and the self-denial, however, which a personal engagement in the missionary service in foreign lands requires, is so great, and the zeal of the disciples to spread the triumphs of the cross among remote and barbarous tribes of men is so small, that it must be long indeed before such a result can be anticipated, unless there is a very great increase of the true heroic and enterprising spirit of primitive times. Whatever tends to promote this, and to deepen the longing-desires of the visible family of God that His “kingdom may come” and His “will be done” in the “dark places” of the earth, should be earnestly encouraged. There are therefore three ends which may be proposed in the act of consecration to the work of Foreign Missions. This may be chosen like any other form of Christian action, to exemplify the practical influence of real piety—or, from a desire by a sincere and cordial and self-denied example of this sort, to aid and countenance the important and too much neglected duty of carrying the gospel to the heathen, or finally from the hope of a direct and immediate usefulness to the heathen themselves. The two former of these objects will be attained wherever love to Christ and holy principle is the moving cause, however brief or disastrous may be the effort itself. It is a great mistake therefore to suppose that the great moral ends of the undertaking are defeated, when the heralds of Christianity are cut down by the stroke of death before they enter upon the work; or where no actual conversions have been made. This would be to make the value of every effort to glorify the Redeemer to depend upon the measure of success which attended it, and imply a course of reasoning manifestly incompatible with fact. Image source: The photograph, above right, is scanned from an original preserved at the PCA Historical Center. It was found tucked inside an 1858 pamphlet which had been purchased from a bookseller in Philadelphia. Keeping in mind that newspapers were little different then than now, subject to the same human foibles*, nonetheless the following coverage of the modernist controversy and the resulting denominational split is interesting, as it offers some different perspectives on what a division means to those involved. This article is from a Wilmington, DE newspaper, dated June 29, 1936, and is found preserved in one of seven scrapbooks gathered by the Rev. Henry G. Welbon, covering the modernist controversy in the years 1935-1939. The photographs have been added and were not part of the original article. Dissension with all the heartaches and strained loyalties that civil war brings, is definitely wedged in the Presbyterian Church in the U.S.A.
Where it will lead and the effect of the wedge, no one knows. But this much is already evident in the Presbytery of New Castle, which embraced Delaware and parts of Maryland: families are divided, parents against children, husbands against wives, and friend with friend. This is a time when members of congregations are torn between loyalty to their established church, when men are being accused of dogmatism, heresy, apostasy and free will. Out of the seething cauldron has been born a new church, the Presbyterian Church in [sic; should be “of”] America, in contrast to the old Presbyterian Church in the U.S.A. The nature of the wedge that is lodged in the church of the U.S.A. today is itself controversial. Those who are remaining loyal say the split is on a church constitutional question and among the loyalists are both fundamentalists and modernists. “The matter now and never has been a controversy between ‘fundamentalists’ and ‘modernists’ the general council of the Presbyterian Church in the U.S.A. states. It is a question the general council states, of whether ministers shall disobey the established constitution of a church and agree to the will of the majority. The secessionists–all fundamentalists–say the differences are based upon doctrinal questions and liberty of conscience. In any case, the immediate cause of the secession and the controversy has been the Independent Board of [sic; should be “for”] Presbyterian Foreign Missions, a board with no official connection with the Presbyterian Church in the U.S.A. The leading personality in the Independent Board of Presbyterian Foreign Missions has been the Rev. Dr. J. Gresham Machen of the Presbytery of New Brunswick, N.J.
For those not familiar with Presbyterian Church government, it should be explained that the judicatory and administrative bodies of the church are: First, the session, composed of representatives of a congregation, governing the church; second, the Presbytery governing a group of sessions in a district; third, the synod, a group of Presbyteries and fourth, the General Assembly which is the national ruling body of the Presbyterian Church which also is the supreme court and lawmaking body of the entire church. Also as part of the story of the Independent Board of Presbyterian Foreign Missions is Pearl Buck, a missionary in China, whom it was charged was too much a modernist. Though she resigned, the charges persisted from the militant fundamentalists of the Presbyterian Church against the alleged modernism in the foreign mission groups. 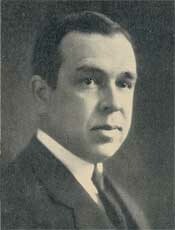 In 1933, Dr. Machen introduced into the Presbytery of New Brunswick a proposed resolution to be presented to General Assembly relating to what he called “modernism” in the Presbyterian Board of Foreign Missions. A large majority of the Presbytery of New Brunswick refused to send this resolution to General Assembly but similar resolutions did reach General Assembly in 1933. The assembly received it and Dr. Machen was heard by the committee to which the resolutions had been presented for consideration. By a vote of 43 to 2, the committee reported unfavorably and expressed its confidence in the Board of Foreign Missions and by a nearly unanimous vote, the General Assembly approved the report of this committee. To this board came the Rev. 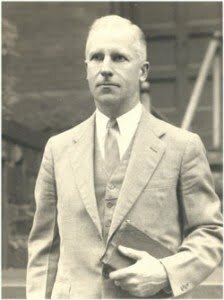 Harold S. Laird, pastor of the First and Central Presbyterian Church of Wilmington, an ardent fundamentalist. But before he joined the independent board, he consulted with his session. He did not join against their counsel. Another point, not widely known, is that Mr. Laird during his pastorate at First and Central Presbyterian Church never solicited for the Independent Board of Presbyterian Foreign Missions. “It was only after much earnest prayer and careful consideration,” he said, “that I came to the conviction that this movement was of God, and being thus convinced, I agreed to throw what little influence I have in the church to the lifting high of this standard. This was my primary motive in allowing myself to be elected a member of the Independent Board for Presbyterian Foreign Missions. Taking note of this independent board and that ministers and elders were prominent in its membership, the General Assembly directed that all ministers and laymen affiliated with the board sever their connections with the organization. Those who declined to obey this direction were ordered tried by their Presbyteries. A number were found guilty and either rebuked or suspended. Mr. Laird tried before the Presbytery of New Castle, protested that his affiliation with the independent board had been guided by his conscience and that in refusing to sever his connection, he was placing the word of God above the courts of man. Mr. Laird, however, was found guilty, with one dissenting vote in his favor. He was ordered rebuked but allowed to remain [in] his pulpit. 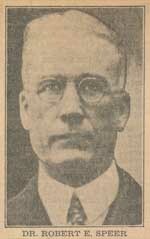 But Mr. Laird continued in the membership of the independent board. The Presbytery recently suspended him from the ministry–an act regarded as illegal by Mr. Laird who immediately renounced the authority of the Presbytery. Unity is a precious thing, to be cultivated and prized. But Christian unity must be centered on the saving Gospel of our Lord Jesus Christ. Where we have that unity, it is glorious. Without Jesus Christ as our Cornerstone, there can be no Church. 51 Do you think that I have come to give peace on earth? No, I tell you, but rather division. The day of the debate had brought a crowd of Presbyterian elders to the sanctuary of the Fourth Presbyterian Church on that day of April 11, 1933. The topic was “Modernism on the Mission Field.” And the two individuals engaging in the debate were two “heavies” on opposite sides of the issue. 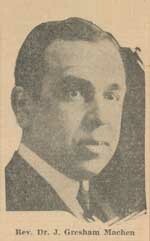 Dr. J. Gresham Machen was the recognized leader of the conservatives in the Presbyterian Church, U.S.A. Founder and president of Westminster Theological Seminary in Philadelphia, Pennsylvania, he was still a member minister of the New Brunswick, New Jersey Presbytery, though he had tried unsuccessfully to transfer to the Philadelphia Presbytery. Against him was Dr. Robert Speer, present head of the Board of Foreign Missions of the Presbyterian Church, U.S.A.
Dr. Machen began his presentation with a proposed overture from the Presbytery of New Brunswick to the General Assembly of 1933. The first two of four parts are the key ones, which I will quote word for word from the April 1933 Christianity Today article, and sum up the other two. In essence, this first proposition simply summed up the Declarations of the General Assembly’s five fundamentals which were considered as essential for the Church, its boards, and its ministers. It specifically repudiated the denials of the same by the Auburn Affirmation in 1924. This proposition addressed the important place which the Candidate Secretary has in ascertaining the theological convictions which each missionary candidate has to serve on the Foreign Field. In other words, in people such as Pearl Buck, who was openly denying the exclusiveness of the gospel of Christ, it is obvious that the Candidate Secretary had “missed the boat” in approving her as being a missionary to China. The third proposition summed up that those who held that the tolerance of opposing views was more important than an unswerving faithfulness in the proclamation of the Gospel as it is contained in the Word of God, show themselves to be unworthy of being missionaries of the cross. This proposition was aimed at those who had accepted the fundamental viewpoint of the book, “Rethinking Missions,” that denied the exclusivity of the gospel. The last proposition sought to warn the Board of the great dangers lurking with union enterprises in view of wide-spread error. Dr. Speer for his part of the “debate” simply dismissed each of the overture propositions. When the vote was taken on Dr. Machen’s proposed overture, it was voted down by the Presbytery of New Brunswick, with a majority voting in favor of confidence in the Board of Foreign Missions. Dr. Machen, Rev. Samuel Craig, and Dr. Casper Wistar Hodge asked that their names be recorded in dissent of the motion. For a fuller account of the debate, click here. Words to Live By: We are always called upon to stand faithfully for the gospel. The results on this earth may be not what we have hoped for, but the results in the General Assembly of heaven are what counts for time and eternity. In 1838 he became the pastor of the Sixth Church, in Phila­delphia, and continued so for twenty-three years, his efforts being crowned with a manifest blessing. From 1861 to 1868 he was Secretary of the Relief Fund for Disabled Ministers, in which capacity he did a noble work, for which he deserves the lasting gratitude of the Church. He died on December 22d of 1868. Of his principal work, often referred to as The Effects of Physical Causes on Christian Experience,’’ Dr. J. W. Alexander wrote, “It is a valuable and entertaining book.” Rev. Jones must have been a close friend and associate of the Rev. Ashbel Green, for it was to Jones that Green turned for the task of bringing Green’s autobiography to the press. Rev. Jones also wrote a history of the 1837 revival at New Brunswick, and several sermons of his were published as well.